From Market Watch July 30, 2015. The U.S. economy grew somewhat more slowly from 2012 to 2014 than previously estimated, according to a new government approach to gross domestic product that addresses flaws in how the report is produced. The U.S. expanded at average 2% rate each year from 2012 to 2014 instead of 2.3% as reported under the old method of calculating GDP, the Bureau of Economic Analysis said. GDP reflects the value of all goods and services produced by the U.S. and is viewed as the best general measure of a nation’s economic health. In short, the slowest U.S. recovery since the end of World War II is even weaker than everyone thought. The BEA on Thursday unveiled a new-look GDP that’s supposed to correct flaws in how military outlays and spending on consumer services such as health care are treated, among other things. The new report also incorporates changes in how certain taxes and social benefits are categorized. The first phase of the changes were rolled out Thursday. Two more phases will follow next year, potentially leading to more significant revisions to U.S. growth over the past few years. 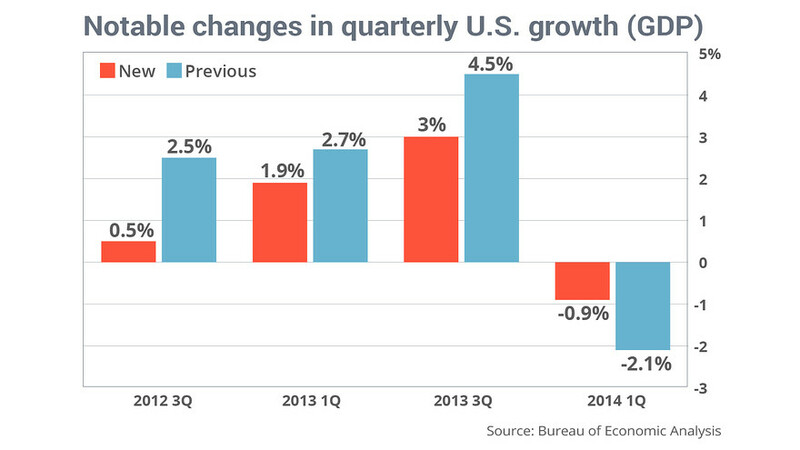 Under the new GDP formula, U.S. growth in 2012 was trimmed to 2.2% from 2.3%. Growth in 2013 was chopped to 1.5% from 2.2%. And GDP in 2014 was unchanged at 2.4%. Government bean counters began to reengineer the GDP report after the economy showed a contraction in the first quarter for the third time in five years. Historically the U.S. economy rarely shrinks during an economic expansion. This entry was posted in Barack Obama, Citizen News, Citizens for the truth about Obama, CitizenWells, Economy, Employment, Lies and tagged GDP revisions reveal slower growth from 2012 to 2014, New GDP reporting supposed to correct flaws in how military outlays and spending on consumer services such as health care are treated, Slowest US recovery since end of World War II is even weaker. Bookmark the permalink. “The US economy contracted .7 percent instead of the sluggish .2 reported earlier. Not to worry, it’s just another anomaly, probably the harsh winter brought on by climate change. From Zero Hedge May 29, 2015.